Local artists were invited to participate in the Artery, a public outdoor art installation from the brainchild of former Eureka Springs resident Charlotte Buchannan. Artists were given a 4 x 8 ft. panel and asked to create a piece of art inspired by the theme of flowers, fruits or vegetables. The individual panels were then attached in a row along an 90 foot concrete wall parking lot, also used for a Sunday Market and Outdoor Movie event. The original plan was to brighten up the blighted area with public art and give exposure to our significant artist community. Panels would be rotated on an annual basis with the theme changing every year. I also participated in the Artery wall the following year when the theme was the four seasons. I have always been intrigued by the paint square samples given out freely by hardware and paint stores with the overwhelming choices of colors and shades to choose from. I was even more intrigued by the names of the colors always printed on the lower right corner of the sample. Imagine a job where you had to come up with creative names for colors all day long – kinda like a dream job. Anyway, the paint chips became the inspiration for “The Four Seasons,” what I originally thought would be a clean, minimalist and straightforward take on the theme. I divided the 8 x 4 ft. panel into four horizontal sections and sorted the paint squares into their seasonal colors (who knew there were so many different shades of white?) Whites for winter – shades of green for spring – reds, oranges and ochre’s for fall – and pink, lilac and blue’s for summer. I then arranged and glued the squares closely abutted in rows in their seasonal section. 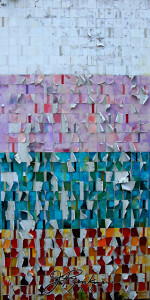 Four equal sections that depicted the colors of the four seasons until some of the paint squares started bubbling up and peeling off because of using the wrong adhesive. 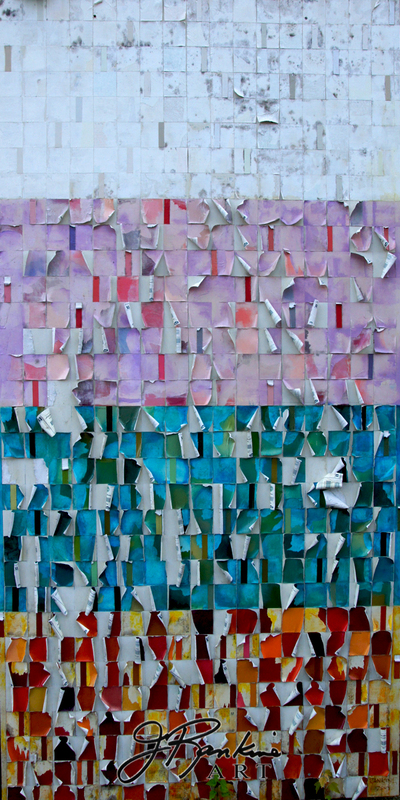 In my mind the paint squares had to be perfectly executed and aligned for the minimalist statement to work, thus I started madly ripping and tearing off some of the bubbling pieces, forcing me to rethink the entire work. Not all of the swatches came unglued and I began adding and gluing horizontally cut strips of squares along with adding paint. Finally finished, and satisfied with the painted result, I slapped 5 coats of exterior polyurethane over the piece and hung it along side the other art works on the wall. About fourth months later I noticed that some of the corners of the paint swatches were lifting and decided there was not a whole bunch I could do about it except watch and document the slow deterioration. Five coats of polyurethane were obviously not enough to protect the panel. Extreme heat, torrential rain and hail – snow and a severe ice storm had taken its toll. “The Four Seasons” had gone through four seasons. Unfortunately most of the documentation was lost, with the exception of the beginning and end.